Much hype has surrounded the dramatic announcement by the PM on 8th November that the existing Rs. 500 and Rs. 1000 notes would cease to be legal tender within a few hours of that announcement. Statements such as “A historic step to fight corruption, black money, terrorism and counterfeit currency” or the “boldest decision in the financial history of independent India” are representative of the way the measure has been sought to be described by the ruling regime and its support brigade. Any criticism of the move has been met by taunts suggesting that it is nothing but attempts to sabotage the all-out war against corruption, black money and terrorism launched by the Modi Government. The daily reports in the media about serpentine queues, non-functioning ATMs and cashless bank branches, disruption of trade are dismissed as temporary inconveniences which all ‘patriotic’ Indians are ‘cheerfully’ bearing (even though they appear to be extremely frustrated). While the Modi regime is trying to frame the issue in dishonest rich versus suffering poor terms and posing itself as the defender of the latter, the Government has put out nothing which would explain clearly the precise mechanism by which the withdrawal/replacement of the old 500 and 1000 rupee notes would achieve their stated objectives and the estimated long-term benefits and short-term costs of such a move.It does not even appear that any proper study that would answer these questions was done before taking such a drastic measure. In other words, the desirability of the measure is to be accepted as an article of faith and not something that has been established through proper reasoning and analysis. The hype is simply the instrument for this propaganda and its associated cover-up. Any dispassionate analysis of the move and its possible implications would, however, raise certain very troubling questions about what is referred to somewhat inaccurately as ‘demonetization’. It is not that the use of currency or money (which includes more than just currency) is being eliminated. Formally, an existing set of currency notes is being replaced by a new set of equivalent value accompanying which would be a temporary reduction in the quantity of that currency in circulation. The replacement of old currency notes by new ones (of the same, smaller or larger denominations) necessarily involves a transition period as the change on such a large scale cannot be done in one go. The scale in this case is in fact unusually large, different from earlier demonetizations when currency in denominations too high relative to prevalent price levels to be held by most people were affected. The current demonetization requires over 85% of the Rs. 18 lakh crores worth stock of currency in circulation to be replaced. Roughly 1600 crore 500 rupee and 700 crore 1000 rupee notes have to be thus changed.Moreover, while it is possible for both old and new currency notes to co-exist and be in use during a transition period,the current scheme has been designed to eliminate this possibility. The old notes of 500 and 1000 rupee denominations arenotlegally usable generally to settle transactions during thetransition – which means that for that duration the quantum of currency available in the hands of the public which can be used to make payments must be less than what it was just before. Indeed, the quantum of legitimate currency in circulation should be less even after the transition period is over. In the process, some people should have suffered in a loss in the form of a destruction of their purchasing power. Indeed, unless this is the case the scheme would have to be deemed a complete failure! The basis for this comes from the very assumptions underlying the stated objectives of the scheme – namely to curb fake currency as well as to check ‘black money’. These imply that some part of the currency in circulation on 8th November would not be convertible into new notes. Partly this would happen if conversion of fake currency is refused – and unless that is done, the conversion process would only replace fake with genuine currency. The other part which would not get converted is the black money or unaccounted income held as cash which is not brought forward to be exchanged as those possessing it cannot explain the origins of these holdings and fear investigation and action. Several questions thus automatically arise. What would be the immediate consequences of the disruptive effects on transactions of the transition? Who will bear the costs of this disruption and the destruction of purchasing power and to what degree? What would be the long run consequences of this demonetization – would there be significant benefits which would outweigh the short-term costs? Disruption of transactions during the transition would happen both because the means to undertake transactions are not available or cannot be used as well as the fact that time and effort must be expended by everyone for the specific purpose of changing their old notes or acquiring the new ones. Further, the general shortage of currency may induce those holding currency in smaller denominations that are still valid to stretch their cash balances – hold back the use of such currency for some purposes in order to preserve them for more essential expenditures. This would reinforce the shortage of currency, and also block the use of valid notes because ‘change’ is not available.It should also be emphasized that any disruption of transactions would also have multiplier effects as other transactions which are contingent upon preceding transactions having taken place would also get affected. Thus, if a shopkeeper is unable to sell his goods in exchange for money, he may also withhold purchases from his supplier who in turn may not hire a truck to transport his goods and so on.Similarly, if a farmer is unable to sell his product at the Mandi in exchange for cash or get credit in cash from the trader, he may not be able to purchase seeds and fertilizers from their suppliers. On the other hand a factory or any other production unit may not be able to undertake production activity because it is unable to purchase its raw materials and inputs,or pay wages, with its existing holding of cash and is also unable to convert its stocks of finished goods into money because the buyers don’t have the means to buy. 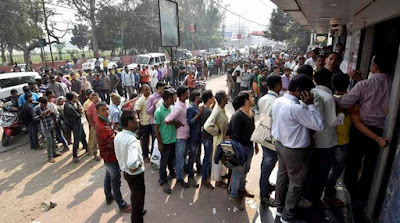 Everyone spending time going to a bank or ATM and standing in queues would also not be able to undertake any work or any other transacting activity at that time. Some of the potentially affected transactions would of course still take place if there was sufficient trust between transacting parties to convert what might otherwise have been cash transactions into credit transactions – the seller could provide the buyer with the goods or services with payment being deferred. Some could migrate to non-cash methods of payment (cheques, cards, electronic transfers, etc.) if such an option were available. Some transactions may still take placeusing the old currency, legally where permittedand illegally where the holder of the money has more pressing needs and lesser ability to convert currency than the receiver of the money and is willing to pay a cost (‘commission’). Indeed some transactions may even get created simply for such a purpose. Some other transactions may get deferred or postponed till the liquidity crunch ends. However, there would always be transactions which would simply get cancelled. In some cases like those of perishables, the cancellation of transactions would be inevitable as the goods themselves could be destroyed before they are sold. In other words, during the transition period economic activity through which incomes are generated – even when they are not legally illicit activities and will not give rise to unaccounted incomes – will be disrupted, which means some short run contraction of income generation. The contraction of economic activity is also something that would tend to reduce the tax revenues (unless counteracted by the ‘unearthing’ of black incomes) and therefore government expenditure, which would reinforce the contractionary effect. While one may debate about its extent, that there will be some loss of current period GDP cannot be disputed. You cannot suddenly withdraw a significant part of the currency in circulation in a currency using capitalist economy and not expect it to have such an effect.Yet the Government and those supporting the demonetization measure have not put out any estimate of this economic loss and the basis for such an estimate. This is in stark contrast to the figures of ‘loss to the nation’ routinely dished out whenever workers go on strike. One of the perverse trade-offs created by the demonetization method of dealing with illicit incomes is that the greater is the proportion of illicit cash holding in total currency holding and the greater the part that is successfully thwarted from being converted, the greater would also be the short-run contractionary effect on the economy. This is because if the conversion of any part of currency holding is blocked, the purchases that would have been made with that currency by its current holders would never be made. The destruction of their purchasing power in this case is through a process that does not place an equivalent amount in the hands of anyone else to spend.This may be contrasted with an alternative where the income-tax authorities manage to make those with unaccounted income pay their taxes – in which case whatever is lost by them in terms of purchasing power is spent by the government which receives it as revenue. Similarly, if someone does not have to pay a bribe to get some work done, he or she would be able to undertake expenditure with that amount instead of the bribe-receiver spending it. Withdrawal of old currencyon the other hand could inflict a one-timeloss on recipients of illicit income, but it would do so precisely by the currency not being converted to keep the income source remaining hidden. Thus, a set of purchases that would have been made with such currency would not be made at all, which in turn would have multiplier effects. It should be obvious that none of this amounts to saying that counterfeit currency, corruption or black incomes are essential for the economy and generation of income. Transactions rather than their illegality is the requirement so that there would be no problem if legitimate transactions replace ones tainted by illegality. If, however, illicit incomes are sought to be curbed not by preventing them from being earned or taking that form but simply by preventing some part of them being spent, then it cannot but also adversely affect legitimate income generating activity because different income-generating activities are inter-connected with each other.Not all economic activity from which illicit income is generated for some is by itself illegitimate and neither is all economic activity or income earning sustained by expenditure of illicit incomes. For instance, a businessman evading taxes and his employees could earn an income from a perfectly legal activity like say retail trade or production of cloth, as could the shopkeepers or suppliers from whom the businessman buys with the income that is hidden from income-tax authorities including the evaded taxes part.The employees or the sellers from whom the businessman buys may not be guilty of any illegality. On the other hand, some of the buyers of the businessman could be spending in the process income earned through bribes. Who are the Losers? Only the Black-marketeers? As should be obvious from the preceding discussion, the adverse effects of the contractionary macroeconomic impact of demonetization will certainly not be limited to those who are the real culprits behind the black economy or counterfeit currency. Indeed, it would be laughable to suggest that the disruption of income generation and loss of GDP will not affect the poor and working people of this country. Given theprevailing economic structure, if economic activity contracts so will the work (in wage as well as self-employment) available for them and the income they receive. Indeed, for those who already get so little the consequences would be much more than that which could be described as a simple ‘temporary inconvenience’.In an economy where labour is very cheap, the simple aggregate magnitude of this loss may not give rise to a very large figure but precisely for that reason its impact on the lives of those affected could be extremely significant. The loss of work that is the effect of the disruption of economic activitymay not always even appear to be linked to demonetization. It should also be evident that the more visible disruptive effects on the lives of the poor and working people would be severe, again not despite but because they have so little. Their dependence on cash, both for their limited consumption expenditure as well as for holding their meagre savings, is much greater than those higher up in the income ladder while their ability to access banking facilities (needed for the conversion), alternative payments mechanisms and credit ismuch less. At the same time, they also face greater difficulties in staying away from work to find time to convert their currency holdings.Thus, while their need to convert their currency may be far more pressing than those who have access to other means of payment, the difficulties faced may be much greater. A large majority of Indians, therefore, are going to experience a double hit because of demonetization – on the one hand it would reduce the ‘money’ that comes into their hands as remuneration for one or another kind of work and on the other it would increase the costs of using what they currently have. That currency of smaller denominations has not been affected by the demonetization provides no solace because at current price levels, the value of even a Rs. 500 or Rs. 1000 note is not very high. Consequently, wages are often received in these denominations rather than smaller ones. Small savings in cash or lumpsum expenditures (like on marriages or purchase of a jhuggi or even payment of rent) are also undertaken by those with low incomes in such denominations. Receipts and purchases of those who are self-employed (like vegetable vendors, small retailers, rickshaw pullers, etc.) may be of much higher level than the income generated from such employment and are also undertaken in larger denomination currency. Moreover, the potential employers of many wage-earners certainly use such currency in the activity for which employment is created. Only someone with no knowledge of the reality of the Indian economy can thus argue that only those who are both rich and corrupt are affected by the withdrawal of the legal tender status of the existing 500 and 1000 rupee notes. In fact, contraction of economic activity will temporarily hurt some of the highor middle income earning groups even when they have indulged in no illegality and have access to non-cash means of payment. The difference is that their difficulties may not be as severe as that of the poor. Even with regard to the currency that cannot be converted, it is not true that only the real culprits will suffer the destruction of their purchasing power. In the case of fake or counterfeit currency, it is almost by definition true that the creators of fake currency would not be the ones holding it – such currency goes into circulation only when they use it for making any payments. Once it goes into circulation and keeps changing hands – it could at the point of time demonetization happens be in the hands of anyone.Even the government has accepted that it is almost impossible for people to distinguish between genuine and fake currency. Imagine for example a terrorist using fake currency to purchase a sim or pay rent, parts of which are then used by the retailer and the landlord to purchase their provisions or pay their employees. At the moment of demonetization, the counterfeit currency may thus be spread between all these individuals or those they make payments to, none of whom are responsible for producing it. It's a slightly different scenario when it comes to genuine currency which is the counterpart of illegal or unaccounted or unexplainable income. That all such holdings will result in dead losses for their holders would only be true if it was correctthat the mechanisms by which such income is hidden cannot be also used to ensure successful conversion into new notes. In business activities some of it could even be declared as resulting from income of the current year – which would mean paying taxes at current rates but not a loss of the entire holding. If declared as proceeds from agricultural income, even this tax could perhaps be avoided. Alternatively, it could be shown as proceeds from sales (which is not the same thing as income) intended to be used to make business related purchases. In short, if the existing mechanisms of keeping income out of the tax net are not eliminated, and demonetization by itself does not achieve that result, those with illicit cash holdings might still be able to beat some of the potential adverse effect on their holdings. The habitual tax-evaders and counterfeiters and those who are corrupt may thus find some escape route tocut their losses, or recoup them through future generation of illicit income. Some who are not in that category but having to engage in transactions where the influence of black money is structurally given may, on the other hand, suffer heavy losses. Everyone knows that the purchase and sale of existing properties in India often involves a large cash (undeclared) component, to the extent that an individual transactor often may not be able to either sell or buy a property if a no cash transaction is insisted upon. Even people who are not fundamentally dishonest but by chance happen to be among those holding large amount of currency in the course of property transactions can therefore be hit by a withdrawal of the currency’s legal tender status. In short, in an economic context where legality and illegality co-exist and do not have clearly demarcated spheres, the distribution of the economic costsof demonetization cannot be distributed across individuals in society proportionate to their dishonesty and contribution to illegality. Given that, the justification for the resort to it must be that it contributes in a big way to achieving longer term objectives including the curbing of illicit incomes. Does it do that? The Death Knell of the Black Economy, Corruption and Counterfeit Currency? The value of the currency that was in circulation whose legal tender status has been withdrawn is barely 10 per cent of one year’s GDP. Some part (4 % of the total currency in circulation) is always held by banks as cash reserves to cover gaps between deposits and withdrawals of cash by their customers. All business firms and commercial entities similarly hold stocks of currency to cover gaps between the receipts and expenditures involving cash transactions associated with their business. Almost allindividuals hold at any point of time some currency in their pockets to meet theirimmediate payment requirements. While the currency may keep changing hands through transactions, the aggregate quantity held in the economy as a whole remains unchanged by such transfers. Certainly all such holding of currency in the economy is not ‘black money’. In fact, even without the demand for currency created by the black economy the requirement for currency tends to be significant in an economy like India’s where capitalist development has over time commodified almost all economic activities and dragged them into the nexus of money and finance even as it has shut out a significant part from the accessing the advantages of financial development. When average incomes are very low and most the population is rural, as is the case with India, a larger proportion of transactions would tend to have a size and nature that makes cash the most convenient method of payment and a larger proportion of people or economic units would tend to be of a kind who cannot make or receive payment in other forms.The infrastructure needed for other forms of payment also tends to be underdeveloped and tends to exclude low-income groups from access. The exceptionally large ‘informal’ component in Indian capitalism, whose causes are structural, also constrains the use of non-cash means of payment. On all these counts that make for greater prevalence of currency use, India leaves far behind all the other major economies of the world. Despite that, it is not even the case that the currency-GDP ratio in India is higher than everywhere else – it is in fact lower than in some advanced economies like Japan. If all currency holding in the economy is not resulting from illicit incomes, what is the proportion that is? Even if one assumes that 25% of it is of that kind and all of it will not be convertible into new notes, the loss to the black economy as a direct result of demonetization would be 2.5 per cent of the GDP (of course it will also experience some of the effects of the general contractionary effect on the economy). Since estimates of its size place the black economy at anywhere between 25 to 50 per cent of GDP, the loss to the black economy in the aggregate would less than 10 per cent. This would leave illicit income earners still better off than they would be without such income or by declaring them and paying tax. Moreover, this would be a one-off loss leaving untouched the illicit incomes of earlier years or of the current year that has already been spent for consumption purposes or to acquire assets (gold, real estate or even producer goods and goods for trading). The point to realize is that blackincomes are not ‘earned’ to be permanently hoarded in the form of currency – they keep getting used in purchases. It is also not the case that the flow of illicit money is entirely in the form of currency, whose genuine component by the way also goes into circulationthrough the formal banking system and keeps recurrently going in and out of it. In today’s world,large volumes of illicit moneyflows go through banks and other financial institutions and they also moveacross international borders– posing a problem even for advanced economies where the volume of cash transactions is relatively low.It is not Rs. 500 and Rs. 1000 notes that are stashed in Swiss Bank accounts or other offshore entities as revealed by the “Panama Papers”! Neither are such notes the form in which investments in Indian financial markets are made by various domestic and foreign entities whose ultimate beneficial ownership (and even their nationality) remains hidden. Everyone involved in management of the economy is familiar with the phenomenon of round-tripping and the use of tax havens by the wealthy of the world including Indians. Even within the domestic economy, is it not true that large corporate entities and wealthy Indians with extremely fat bank accounts and billions of rupees worth of non-cash transactions do manage to pay bribes and evade taxes? To put things in perspective, one may note some figures. Recorded transactions through the banking system in 2015-16 in India were of the value of over Rs. 1800 lakh crores, nearly 14 times the country’s GDP. A little over 5 crore entities (individuals, firms, companies, etc.) in India pay income-tax but there are nearly 150 crores deposit accounts in banks. As on 28 October 2016, the aggregate value of savings, current and fixed/recurring deposits held in banks by the ‘public’ was Rs. 107 lakh crores – more than 6 times the value of their currency holding on the same day! To argue in these circumstances that the cash using part of the economy is where all illicit income is generated and hidden would either reflect ignorance and living in the distant past or amount to engaging in deliberate subterfuge. The demonetization measure, however, has no effect on the flows that take place through the banking system. Identifying durable or long-term effects of the demonetizationmeasure on illicit income and money is also extremely difficult.Because it involves at best a one off-loss, it does nothing to disincentivize future illicit income generation through corruption or concealing income. The incentive for producing counterfeit currency would always remain as long as the cost of producing it remains significantly below its face value. The very fact that it is not the kind of measure that can be used frequentlyalso works against the fear of possible demonetization being a deterrent for illicit activities in the future. It is also doubtful whether the process of conversion into new notes would generate so much useful additional information as to dramatically improve the ability of the tax administration system to catch the tax evaders – conversion on such a large scale may in fact not be the most efficient way of garnering the required information. Thus, once the old currency is fully replaced (net of that part which is not converted), there is no reason to not expect the situationto be back to where it was before the demonetization. The only difference would be that the currency used in both legitimate and illegitimate transactions would be the new ones rather than the old. Because demonetization is toothless in hitting the real sources of illicit income and its biggest generators, and was preceded by other toothless measures and also an amnesty scheme, it does not even signal a serious intent of the government to dealing with the problem of ‘black money’. Those who do not know the world of black economy may be sold the story about how bold the move is – but those in the heart of it perhaps know better. So why then did the government take recourse to such a dramatic measure? There were clearly some political calculations behind the move and an expectation that this will help in shoring up the sagging reputation of a government and its leader because of its failure to deliver on the expectations that had generated – both among the dominant corporate interests as well as ordinary people. That failure in turn reflects the harsh realities of the neo-liberal economic strategy to which the all governments have been wedded in the last 25 years and the current one to the greatest degree. That strategy has contributed to a situation where tax revenuesin India are constrained by bothlow tax rates on declared incomesof corporates and high-income individuals as well aslarge-scale evasion by them. Responsible for such evasion are also those who are part of the so-called formal economy and have been the biggest beneficiaries of the growth of the last twenty-five years. At the same time, big corporate interests,even as they take great advantage of ‘informality’, also want to expandin some areas like retail trade by encroaching on and displacing the ‘unorganized’ sector on which so many depend for their livelihood. They and different kinds of financial interests within the formal sector also want to gain from shifting many transactions from cash to non-cash forms. Big corporate interests are also interested in the state spending on infrastructure that will benefit their profit-making activities but they do not necessarily want to pay the taxes to finance such expenditure. The false idea that the entire responsibility for the black economy and inadequate tax revenues lies on the ‘informal’ and cash using economy, and the myth that excessive use of currency is the sole problem, has therefore some objective basis in the current realities of Indian capitalism as is the conception that GST will work wonders for the Indian economy. These have been in circulation for some time and reflect in part the ‘rationality’ or outlook of a regime that is deeply and narrowly committed to advancing large corporate interests and unable to look beyond the aggressive pursuit of a neo-liberal path. The Prime Minister who announced the demonetization move also appearing in the advertisements of two private companies, one issued before and one immediately after the announcement, reflects that. Translation of that ‘rationality’and the current economic circumstances into a specific act that many might consider insane, namely demonetization, was not however inevitable – it perhaps depended in addition on the current regime having a deeply ingrained authoritarian character and a leader harbouring ambitions of grandeur. Extreme class bias and the arrogance of authoritarianism, however, also produces a blindness – in this case about the role that currency plays in the lives of India’s people and the effects it will have in them. It is less certain therefore in comparison to many other moves whether demonetization and the political propaganda linked to it willcarry ‘currency’ with the people. Surajit Mazumdar is a Professor of Economics in Jawaharlal Nehru University. Is it possible to get a bullet pointed sumnarised synopsis? It is too scholstic to carry to a common man in the ongoing political attrition.